I've been dying to read If There's No Tomorrow! It looks great, and I love the cover. Lucky in Love also looks good.I really like the lottery aspect of it, and Kasie is the queen of cute romance reads. Happy reading! Ooh nice new reads! Lots of new to me ones! Hope you enjoy them all! 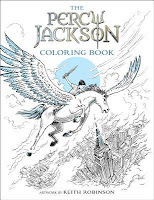 I wasn't aware that there was a Percy Jackson Coloring Book. Great haul of books. So so excited for If Theres No Tomorrow! I know itll be awesome!